As a looping device this is rather basic.You can record a loop, overdub on it, delete it. Plus there’s an Undo for everything you overdub if you don’t go over a certain time limit. There’s couple of delay modes, a basic delay, with feedback control, and a Multi head mode which can send 4 different delay taps to four outputs, (that’s the special trick of the unit). You can tap in a long delay time, but changing the delay time erases all the audio. Changing between modes also loses the audio. Sound quality indicative of cost cutting on the audio path, noticeable lacking in sparkle and depth. The “tape delay” sound, while it may be a useful effect in itself, doesn’t really convince as an emulation. Overall the unit gives the beginner some options: you can record a basic loop; you get to do a bit of structuring with the Undo function; you can set up a long delay with a gradual decay to have a go at “ambient style looping”. boundaries pushed. If only the audio would keep playing as you switched from mode to mode, or re-tapped a different loop length ther could be something happening here…but sadly Akai didn’t allow that. There’s no way to mute the dry signal, so it’s not practical to use on an Aux send from a mixer. 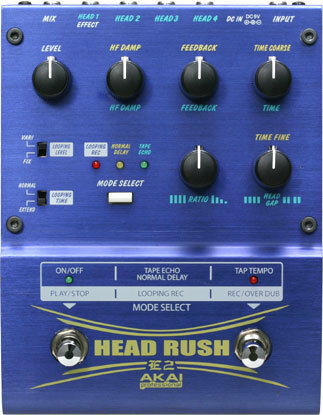 This means that the Headrush isn’t going to find a place providing an extra loop facility in a large looping rig. At the price, it’s probably worth checking out some of the other comparable units before you go for this one.